Citation: C N Trueman "The fall of Singapore"
historylearningsite.co.uk. The History Learning Site, 21 May 2015. 6 Apr 2019. The fall of Singapore to the Japanese Army on February 15th 1942 is considered one of the greatest defeats in the history of the British Army and probably Britain’s worst defeat in World War Two. The fall of Singapore in 1942 clearly illustrated the way Japan was to fight in the Far East – a combination of speed and savagery that only ended with the use of the atomic bomb on Hiroshima in August 1945. Singapore, an island at the southern end of the Malay Peninsula, was considered a vital part of the British Empire and supposedly impregnable as a fortress. The British saw it as the “Gibraltar in the Far East”. 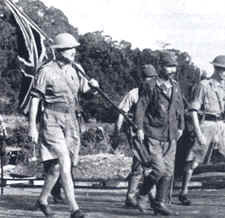 The surrender of Singapore demonstrated to the world that the Japanese Army was a force to be reckoned with though the defeat also ushered in three years of appalling treatment for the Commonwealth POW’s who were caught in Singapore. Improvements to Singapore as a British military base had only been completed at great cost in 1938. Singapore epitomised what the British Empire was all about – a strategically vital military base that protected Britain’s other Commonwealth possessions in the Far East. Once the Japanese expanded throughout the region after Pearl Harbour (December 1941), many in Britain felt that Singapore would become an obvious target for the Japanese. However, the British military command in Singapore was confident that the power they could call on there would make any Japanese attack useless. One story told about the attitude of the British Army in Singapore was of a young Army officer complaining that the newly completed defences in Singapore might put off the Japanese from landing there. British troops stationed in Singapore were also told that the Japanese troops were poor fighters; alright against soldiers in China who were poor fighters themselves, but of little use against the might of the British Army. The Japanese onslaught through the Malay Peninsula took everybody by surprise. Speed was of the essence for the Japanese, never allowing the British forces time to re-group. This was the first time British forces had come up against a full-scale attack by the Japanese. Any thoughts of the Japanese fighting a conventional form of war were soon shattered. The British had confidently predicted that the Japanese would attack from the sea. This explained why all the defences on Singapore pointed out to sea. It was inconceivable to British military planners that the island could be attacked any other way – least of all, through the jungle and mangrove swamps of the Malay Peninsula. But this was exactly the route the Japanese took. The attack on Singapore occurred almost at the same time as Pearl Harbour. By December 9th 1941, the RAF had lost nearly all of its front line aeroplanes after the Japanese had attacked RAF fields in Singapore. Any hope of aerial support for the army was destroyed before the actual attack on Singapore had actually begun. Britain’s naval presence at Singapore was strong. A squadron of warships was stationed there lead by the modern battleship “Prince of Wales” and the battle cruiser “Repulse”. Only the army could stop the Japanese advance on Singapore. The army in the area was led by Lieutenant General Arthur Percival. He had 90,000 men there – British, Indian and Australian troops. The Japanese advanced with 65,000 men lead by General Tomoyuki Yamashita. Many of the Japanese troops had fought in the Manchurian/Chinese campaign and were battle-hardened. Many of Percival’s 90,000 men had never seen combat. At the Battle of Jitra in Malaya (December 11th and 12th 1941), Percival’s men were soundly beaten and from this battle were in full retreat. The Japanese attack was based on speed, ferocity and surprise. To speed their advance on Singapore, the Japanese used bicycles as one means of transport. Captured wounded Allied soldiers were killed where they lay. Those who were not injured but had surrendered were also murdered – some captured Australian troops were doused with petrol and burned to death. Locals who had helped the Allies were tortured before being murdered. The brutality of the Japanese soldiers shocked the British. But the effectiveness of the Japanese was shown when they captured the capital of Malaya, Kuala Lumpur, on January 11th 1942. All the indications were that the Japanese would attack Singapore across the Johor Strait. General Wavell, the British commander in the region, was ordered by Churchill to fight to save Singapore and he was ordered by Churchill not to surrender until there had been “protracted fighting” in an effort to save the city. On January 31st 1942, the British and Australian forces withdrew across the causeway that separated Singapore from Malaya. It was clear that this would be their final stand. Percival spread his men across a 70 mile line – the entire coastline of the island. This proved a mistake. Percival had overestimated the strength of the Japanese. His tactic spread his men out for too thinly for an attack. On February 8th, 1942, the Japanese attacked across the Johor Strait. Many Allied soldiers were simply too far away to influence the outcome of the battle. On February 8th, 23,000 Japanese soldiers attacked Singapore. They advanced with speed and ferocity. At the Alexandra Military Hospital, Japanese soldiers murdered the patients they found there. Percival kept many men away from the Japanese attack fearing that more Japanese would attack along the 70 mile coastline. He has been blamed for failing to back up those troops caught up directly with the fighting but it is now generally accepted that this would not have changed the final outcome but it may only have prolonged the fighting. The Japanese took 100,000 men prisoner in Singapore. Many had just arrived and had not fired a bullet in anger. 9,000 of these men died building the Burma-Thailand railway. The people of Singapore fared worse. Many were of Chinese origin and were slaughtered by the Japanese. After the war, Japan admitted that 5000 had been murdered, but the Chinese population in Singapore put the figure at nearer 50,000. With the evidence of what the Japanese could do to a captured civilian population (as seen at Nanking), 5000 is likely to be an underestimate. The fall of Singapore was a humiliation for the British government. The Japanese had been portrayed as useless soldiers only capable of fighting the militarily inferior Chinese. This assessment clearly rested uncomfortably with how the British Army had done in the peninsula.